Used by recruiters located all over the world, this is one the most popular web templates in our recruitment range. It is highly suitable for a recruitment agency or an HR consultancy in professional careers services. 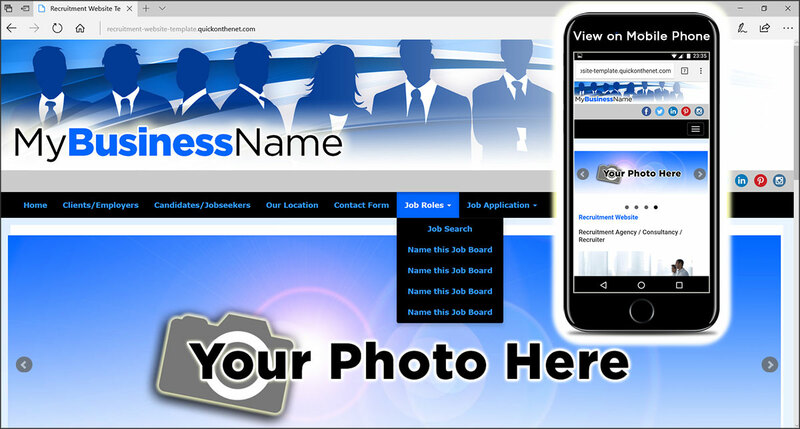 This site already includes menu buttons for Clients / Employers and Candidates / Job-seekers. Within minutes of signing up, you can start posting your own jobs online, using our unique gallery tool. We supply 4 different job boards (Galleries) as standard and each job board can contain lots of click-through jobs. There is a great deal of flexibility, so you can easily add, remove or rename the menu buttons and create new web pages to match your exact needs. In fact, this principle applies to all our websites.